While you might know artichokes as a globular delicacy, with multiple overlapping leaves, this part is actually the flower of the plant. The longer, serrated, "true" leaves found along the stem of the plant are dried to make artichoke tea. Artichoke tea has a grassy, vegetal flavor and can help lower cholesterol and blood pressure levels. In general, however, the health benefits of artichoke tea require further long-term, human study. In a study published in the "Journal of Dietary Supplements" in 2009, patients with slightly raised blood pressure levels were fed a liquid artichoke leaf extract. The scientists conducting the study found that, after 12 weeks, those receiving the artichoke leaf supplement, either 50 or 100 milligrams of artichoke leaf juice, had lower blood pressure levels, regardless of the amount of concentrate they received. Scientists concluded that artichoke leaf may help lower blood pressure levels in those with mild hypertension. If you drink only the liquid from artichoke tea, however, you may not have the same degree of benefits as seen in the study. To ensure full benefits, consume the dredges -- the tea "leaves" -- as well. In 2010, the journal "Phytotherapy Research" published a study on artichoke leaf extract's effect on blood cholesterol levels. Artichoke leaf is rich in antioxidants, which dissolve into tea. Antioxidants can protect your body from damage from free radicals and environmental toxins. Over the course of one month, researchers found that the antioxidants in artichoke leaves led to less oxidative stress in the animal test subjects that received the supplement. Those receiving the supplement also had lower overall blood cholesterol levels. Because the study uses an extract, the level of antioxidants present in tea may not be the same as in the study, so the overall effects may be different. Artichoke leaf is chock-full of polyphenols, a type of antioxidant that dissolves into water. Toxins and free radicals can potentially contribute to heart disease and cancer, and antioxidants may also help to delay the effects of these illnesses. A 2012 publication of the "Journal of Cellular Physiology" found that artichoke leaf extract, when introduced to breast cancer cells, reduced the viability and growth of cancer cells. 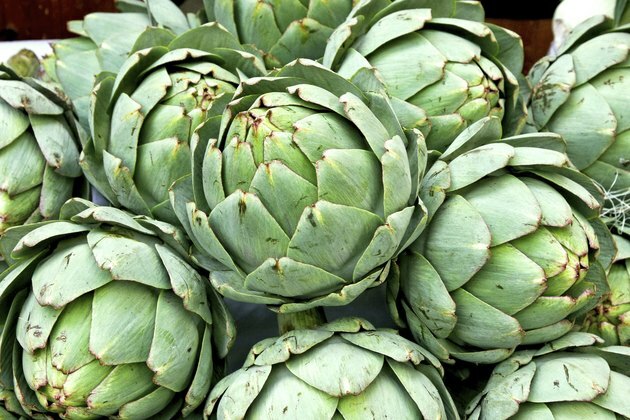 Adding artichoke leaf extract directly to the cells also triggered cancer cell death, potentially indicating that the polyphenols in artichokes have powerful anti-cancer properties. You can purchase artichoke leaf tea in ethnic and health food stores, where the tea is often sold in bags. Use one bag for every 8 ounces of boiling water. With loose-leaf tea, use 1 1/2 teaspoons for every 8 ounces. Because artichoke leaf tea has a natural bitterness, adding some honey or other sugar to sweeten the tea is common. You can also mix the leaves with loose leaf green tea to temper the taste. Iced artichoke tea is common in Southeast Asian diets, especially in Vietnamese culture where the tea is sometimes prepared with other herbs, sweetened and then served chilled. What Are the Benefits of Blackberry Leaves?